The Caviar Manicure. What can I say? The creative director and her team at Ciate really outdid themselves when they came up with this genius idea. Personally I think I this is one of the best nail trends to come around in the last couple of years, since the term ‘nail art’ started to mean a little bit more than a few flicks, dots and gems. I adore the caviar mani and it is definitly my fave mani to date, but as much as I love the pre-mixed blends Ciate has to offer I wanted to do mine in just one colour. 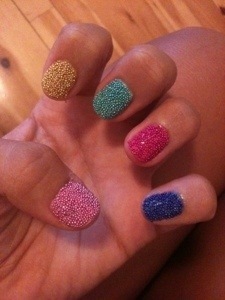 I purchased the pots of single coloured caviar beads and fully intended to do all nails in one colour. but that was much easier said than done! I just could not pick which colour I liked the most so I ended up with a mixed colour mani but it was each nail that was a different colour rather than the standard mixed blends. I am so glad I decided to do it because as soon as I finished the last nail I was in LOVE!! The comments I got from people kept flooding in and the fact it was different colours made the mani stand out so much more. It lasted a full 5 days (including 3 hairwashes, swimming in the sea everyday and washing the dishes at home) which I think is amazing considering you don’t apply a topcoat to caviar manicures and it is just the colour underneath holding the tiny beads in place. I sent the picture of my mani to Grazia’s twitter and I was over the moon because not only did they retweet it, they included it as part of their ‘Manicure Monday’ – They featured me as the cover photo on their website section titled ‘The best nails on Twitter’……Result! Can’t wait to do this manicure again sometime soon.